The Miniature Pinscher was developed from the Dachshund, German Pinscher, and Italian Greyhound to create a lively and affective rat hunter. The name "Pinscher" means "terrier" in german, giving the little terrier its name. The breed was brought to the US in 1919 and became recognized by the AKC in 1925. Today the breed excels in many dog sports as well as a lively companion. 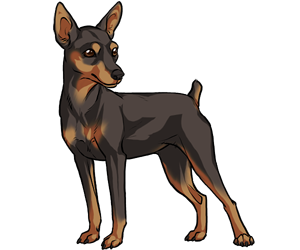 The Miniature Pinscher was developed before the Doberman Pinscher by about 200 years. The breed is called "The King of Toys". Miniature Pinschers are born with floppy ears and long tails which are commonly docked in America.